FILE - In this photo shot through a fence, former Brazilian President Michel Temer, left, is seen at the international airport in Sao Paulo, Brazil, March 21, 2019. A Brazilian federal judge on Monday ordered the release of former President Michel Temer from jail, allowing him to face corruption charges while free. Judge Antonio Ivan Athie said there's no need to jail the 78-year-old politician because he doesn't pose a risk to the investigation into the charges. Brazil's federal police did not say when Temer would be released. Athie's ruling could still be reversed by his colleagues on the same court, which had been expected to decide on Temer's future only on Wednesday. "As I examined the case, I verified that there is no justification to wait for two more days for the decision," the judge said. The ruling also said Bretas' decision to arrest Temer was based on "assumptions on old facts." 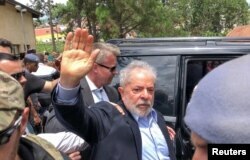 FILE - Former Brazilian President Luiz Inacio Lula da Silva leaves for the cemetery to attend the funeral of his 7-year-old grandson, in Sao Bernardo do Campo, Brazil, March 2, 2019. Once hugely popular, Da Silva, who governed between 2003 and 2010, has only left his prison cell in Southern Brazil city of Curitiba to testify in other lawsuits and to attend his 7-year-old grandson's funeral in March.